The WVS has over the years demonstrated that people’s beliefs play a key role in economic development, the emergence and flourishing of democratic institutions, the rise of gender equality, and the extent to which societies have effective government. Some of the key findings of the work are described below. Survival values versus Self-expression values. The global cultural map (below) shows how scores of societies are located on these two dimensions. 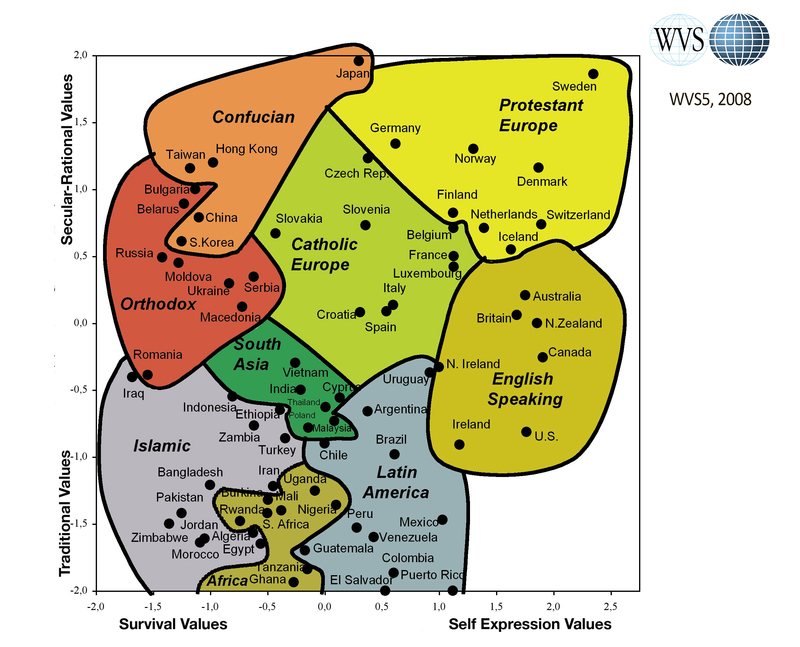 Moving upward on this map reflects the shift from Traditional values to Secular-rational and moving rightward reflects the shift from Survival values to Self–expression values. However, the attitudes among the population are also highly correlated with the philosophical, political and religious ideas that have been dominating in the country. Secular-rational values and materialism were formulated by philosophers and the left-wing politics side in the French revolution, and can consequenlty be observed especially in countries with a long history of social democratic or socialistic policy, and in countries where a large portion of the population have studied philisophy and science at universities. 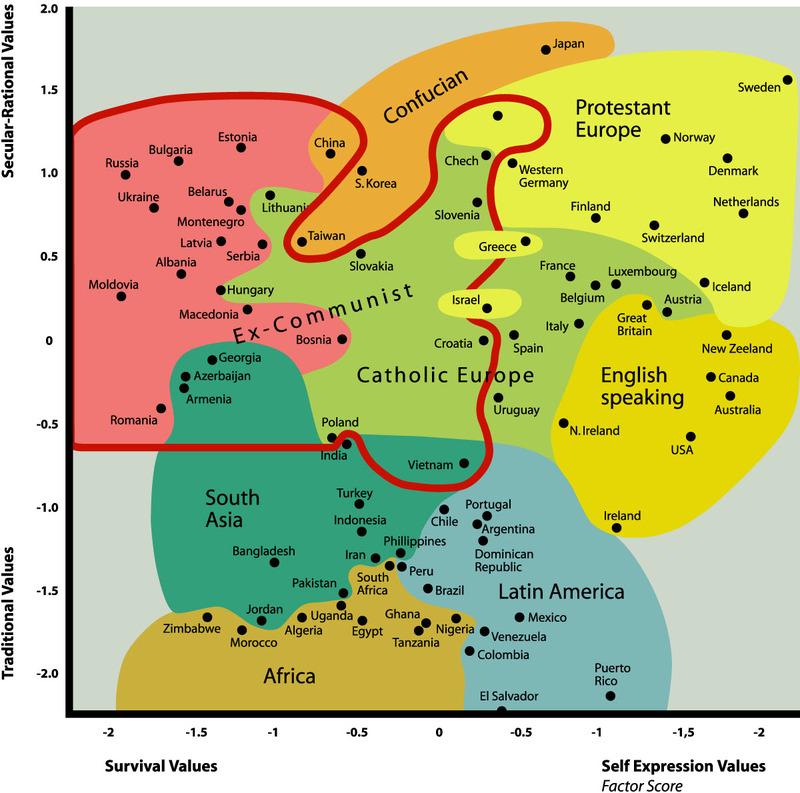 Survival values are characteristic for eastern-world countries and self-expression values for western-world countries. In a liberal post-industrial economy, an increasing share of the population has grown up taking survival and freedom of thought for granted, resulting in that self-expression is highly valued. Societies that have high scores in Traditional and Survival values: Zimbabwe, Morocco, Jordan, Bangladesh. 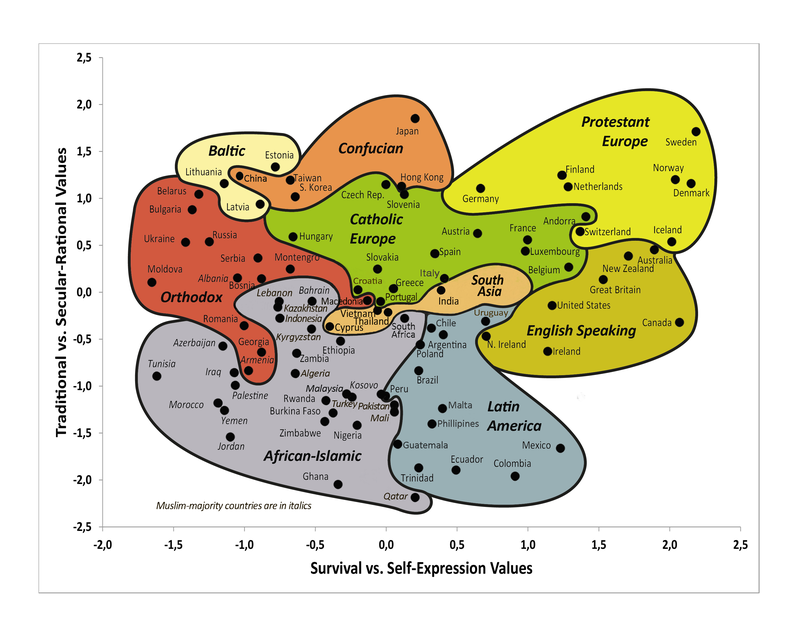 Societies with high scores in Traditional and Self-expression values: the U.S., most of Latin America, Ireland. Societies with high scores in Secular-rational and Survival values: Russia, Bulgaria, Ukraine, Estonia. Societies with high scores in Secular-rational and Self-expression values: Sweden, Norway, Japan, Benelux, Germany, France, Switzerland, Czech Republic, Slovenia, and some English speaking countries. The desire for free choice and autonomy is a universal human aspiration, but it is not top priority when people grow up feeling that survival is uncertain. As long as physical survival remains uncertain, the desire for physical and economic security tends to take higher priority than democracy. When basic physiological and safety needs are fulfilled there is a growing emphasis on self-expression values. Findings from the WVS demonstrate that mass self-expression values are extremely important in the emergence and flourishing of democratic institutions in a society. With industrialization and the rise of postindustrial society, generational replacement makes self-expression values become more wide spread and countries with authoritarian regimes come under growing mass pressure for political liberalization. This process contributed to the dramatic Third Wave Democracy in the late 1980s and early 1990s and is one of the factors contributing to more recent processes of democratization. WVS researchers have identified how the empowerment of ordinary citizens can lead to democracy. This process of human development enables and motivates people to demand democracy, leading to regime changes that entitle people to govern their lives. Growing action resources (such as education), and the spread of self-expression values leads to the emergence of democratic institutions, that enable people to gain growing freedom of choice in how to live their own lives, and to choose their political regime. During the past 30 years, the world has witnessed profound changes in political, economic and social spheres and increasingly rapid technological advances. This is often attributed to the phenomenon of globalization. Capital markets are today integrated around the globe and movies and books circle the world in seconds. Hundreds of millions of people visit the same websites, watch the same TV channels and laugh at the same jokes. These examples have contributed to the belief that globalization brings converging values, or a McDonaldization of the world. In fact, analysis of data from the World Values Survey demonstrate that mass values have not been converging over the past three decades. Norms concerning marriage, family, gender and sexual orientation show dramatic changes but virtually all advanced industrial societies have been moving in the same direction, at roughly similar speeds. This has brought a parallel movement, without convergence. Moreover, while economically advanced societies have been changing rather rapidly, countries that remained economically stagnant showed little value change. As a result, there has been a growing divergence between the prevailing values in low-income countries and high-income countries. Findings from the WVS indicate that support for gender equality is not just a consequence of democratization. It is part of a broader cultural change that is transforming industrialized societies with mass demands for increasingly democratic institutions. 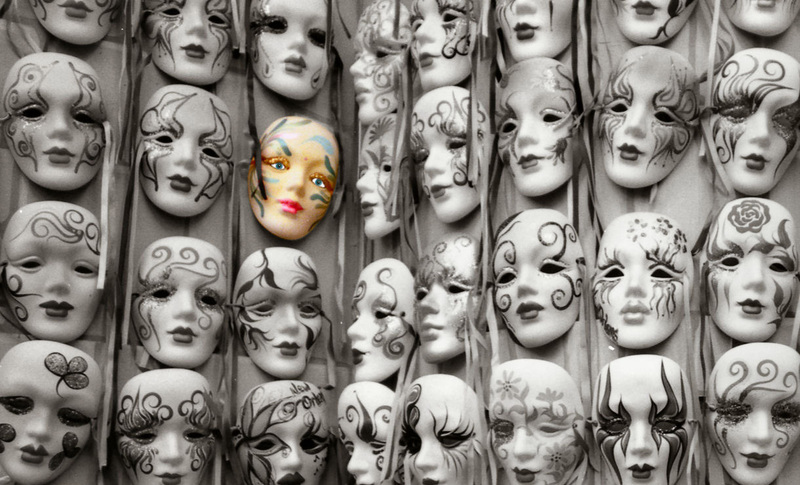 Although a majority of the world’s population still believes that men make better political leaders than women, this view is fading in advanced industrialized societies, and also among young people in less prosperous countries. The data from the World Values Survey cover several important aspects of people’s religious orientation. One of them tracks how involved people are in religious services and how much importance they attach to their religious beliefs. In the data from 2000, 98% of the public in Indonesia said that religion was very important in their lives while in China only three percent considered religion very important. Another aspect concerns people’s attitudes towards the relation between religion and politics and whether they approve of religious spokesmen who try to influence government decisions and people’s voting preferences. The WVS has shown that from 1981 to 2007 happiness rose in 45 of the 52 countries for which long-term data are available. Since 1981, economic development, democratization, and rising social tolerance have increased the extent to which people perceive that they have free choice, which in turn has led to higher levels of happiness around the world. The popular statistics website Nationmaster publishes a simplified world happiness scale derived from the WVS data. The WVS website provides access to the WVS data, allowing users to carry out more complex analyses, such as comparing happiness levels over time or across socio-economic groups. One of the most striking shifts measured by the WVS was the sharp decline in happiness experienced in Russian and many other ex-communist countries during the 1990s. On the first dimension, traditional values emphasize religiosity, national pride, respect for authority, obedience and marriage. Secular-rational values emphasize the opposite on each of these accounts. On the second dimension, survival values involve a priority of security over liberty, non-acceptance of homosexuality, abstinence from political action, distrust in outsiders and a weak sense of happiness. Self-expression values imply the opposite on all these accounts. Following the ‘revised theory of modernization,’ values change in predictable ways with certain aspects of modernity. People’s priorities shift from traditional to secular-rational values as their sense of existential security increases (or backwards from secular-rational values to traditional values as their sense of existential security decreases). The largest increase in existential security occurs with the transition from agrarian to industrial societies. Consequently, the largest shift from traditional towards secular-rational values happens in this phase. People’s priorities shift from survival to self-expression values as their sense of individual agency increases (or backwards from self-expression values to survival as the sense of individual agency decreases). The largest increase in individual agency occurs with the transition from industrial to knowledge societies. Consequently, the largest shift from survival to self-expression values happens in this phase. The value differences between societies around the world show a pronounced culture zone pattern. The strongest emphasis on traditional values and survival values is found in the Islamic societies of the Middle East. By contrast, the strongest emphasis on secular-rational values and self-expression values is found in the Protestant societies of Northern Europe. These culture zone differences reflect different historical pathways of how entire groups of societies entered modernity. These pathways account for people’s different senses of existential security and individual agency, which in turn account for their different emphases on secular-rational values and self-expression values. Values also differ within societies along such cleavage lines as gender, generation, ethnicity, religious denomination, education, income and so forth. Generally speaking, groups whose living conditions provide people with a stronger sense of existential security and individual agency nurture a stronger emphasis on secular-rational values and self-expression values. However, the within-societal differences in people’s values are dwarfed by a factor five to ten by the between-societal differences. On a global scale, basic living conditions differ still much more between than within societies, and so do the experiences of existential security and individual agency that shape people’s values. A specific subset of self-expression values—emancipative values—combines an emphasis on freedom of choice and equality of opportunities. Emancipative values, thus, involve priorities for lifestyle liberty, gender equality, personal autonomy and the voice of the people. Emancipative values constitute the key cultural component of a broader process of human empowerment. Once set in motion, this process empowers people to exercise freedoms in their course of actions. If set in motion, human empowerment advances on three levels. On the socio-economic level, human empowerment advances as growing action resources increase people’s capabilities to exercise freedoms. On the socio-cultural level, human empowerment advances as rising emancipative values increase people’s aspirations to exercise freedoms. On the legal-institutional level, human empowerment advances as widened democratic rights increase people’s entitlements to exercise freedoms. Human empowerment is an entity of empowering capabilities, aspirations, and entitlements. As an entity, human empowerment tends to advance in virtuous spirals or to recede in vicious spirals on each of its three levels. As the cultural component of human empowerment, emancipative values are highly consequential in manifold ways. For one, emancipative values establish a civic form of modern individualism that favours out-group trust and cosmopolitan orientations towards others. Emancipative values encourage nonviolent protest, even against the risk of repression. Thus, emancipative values provide social capital that activates societies, makes publics more self-expressive, and vitalizes civil society. Emancipative values advance entire societies’ civic agency. If emancipative values grow strong in countries that are democratic, they help to prevent movements away from democracy. If emancipative values grow strong in countries that are undemocratic, they help to trigger movements towards democracy. Emancipative values exert these effects because they encourage mass actions that put power holders under pressures to sustain, substantiate or establish democracy, depending on what the current challenge for democracy is. Objective factors that have been found to favour democracy (including economic prosperity, income equality, ethnic homogeneity, world market integration, global media exposure, closeness to democratic neighbours, a Protestant heritage, social capital and so forth) exert an influence on democracy mostly insofar as these factors favour emancipative values. Emancipative values do not strengthen people’s desire for democracy, for the desire for democracy is universal at this point in history. But emancipative values do change the nature of the desire for democracy. And they do so in a double way. For one, emancipative values make people’s understanding of democracy more liberal: people with stronger emancipative values emphasize the empowering features of democracy rather than bread-and-butter and law-and-order issues. Next, emancipative values make people assess the level of their country’s democracy more critical: people with stronger emancipative values rather underrate than overrate their country’s democratic performance. Together, then, emancipative values generate a critical-liberal desire for democracy. The critical-liberal desire for democracy is a formidable force of democratic reforms. And, it is the best available predictor of a country’s effective level of democracy and of other indicators of good governance. Neither democratic traditions nor cognitive mobilization account for the strong positive impact of emancipative values on the critical-liberal desire for democracy. Emancipative values are the most single important factor in advancing the empowerment of women. Economic, religious, and institutional factors that have been found to advance women’s empowerment, do so for the most part because they nurture emancipative values. Emancipative values change people’s life strategy from an emphasis on securing a decent subsistence level to enhancing human agency. As the shift from subsistence to agency affects entire societies, the overall level of subjective well-being rises. The emancipative consequences of the human empowerment process are not a culture-specific peculiarity of the ‘West.’ The same empowerment processes that advance emancipative values and a critical-liberal desire for democracy in the ‘West,’ do the same in the ‘East’ and in other culture zones. The social dominance of Islam and individual identification as Muslim both weaken emancipative values. But among young Muslims with high education, and especially among young Muslim women with high education, the Muslim/Non-Muslim gap over emancipative values closes. A coherent overview of all these findings can be found in Welzel's Freedom Rising (for a full citation, see bibliography below).